The Distinguished Youth Award is presented to a youth of the council who has shown outstanding service as a youth. 2014 | Christopher Michael Long, Jr. The Russell C. Hill Award is the highest recognition for individuals and organizations making an outstanding contribution to character education at the local, state or national level that has added to the quality of life for families through the Learning for Life programs. The Whitney M. Young Jr. Service Award recognizes outstanding service by an adult individual or organization in the development and implementation of Scouting opportunities for youth from rural or low-income urban backgrounds – in fulfillment of Whitney Young’s dream of justice and equality for all. 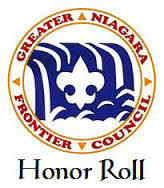 The Greater Niagara Frontier Council strives to create Scouting opportunities for urban, at-risk youth populations in the Cities of Buffalo, Niagara Falls and Lackawanna.